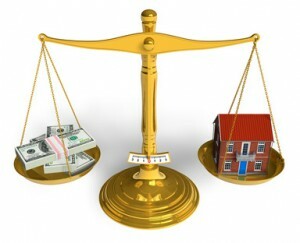 What is the fair market value of my home? Whether you are trying to calculate the value of your home because you are thinking of selling or just out of curiosity, here are five factors to consider. Homes within reasonable walkability to schools or parks will strongly influence buyers with small children. However, homes that boarder school or park property lines may suffer in home value due to unwanted traffic, parking limitations and the likelihood of youth mischief. Where is new growth heading in town? Will there be any new business areas, grocery stores, or libraries in the future? Is the house surrounded by other houses? Apartment complexes? Other buildings? The best possible situation for your home is to be situated between two other houses and located along a road without yellow traffic lines. 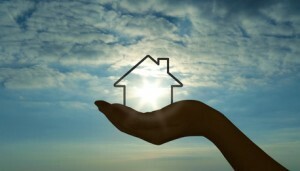 After you buy a house, the market value of your home is affected by who else is likely to purchase the property. If the property is a perfect starter home for pre-family newlyweds, and the main homebuyers in town are senior-citizens, the fair market value of your home might be lower than you think. Older buyers typically look for one story homes without stairs, whereas families with small children often desire homes with a front yard away from a busy street and multiple bathtubs. The more closets, garages and laundry rooms a house has, the higher the fair market value of your home. Most homebuyers look for a walk-in closet in the master bedroom, as well as closets in high traffic areas like front entryways, bathrooms and other bedrooms. The two-door garage is the most common size for most homes, yet three-car garages are becoming more and more common. As for the laundry room, the washer and dryer units should be located together in a common access space without creating an eyesore. Also, the proximity of the kitchen to the dining room and family room will impact the usability of the house and thus is a factor in calculating the value of your home. Homebuyers typically look for homes with three to five bedrooms with an average of one shower per every two bedrooms. Split bedroom plans with bedrooms on opposite sides of the house are a popular trend with modern homes. Also, many real estate professionals love to use the phrase ôlight and brightö to highlight homes with lots of natural lighting. As for size, most residential neighborhoods will have a slight variation in square-footage and number of rooms, but they all should be within a standard deviation of one another. If resale value of your home is a big concern, it’s in your best interest to not buy the largest home in the neighborhood. 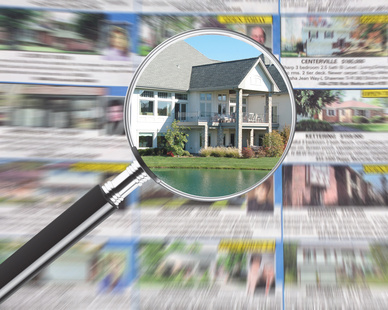 When calculating the market value of your home, real estate professionals measure the homes in the surrounding area against yours, and if most of the nearby properties are smaller than yours, it can act as an anchor to drag down your fair market value. With real estate values down across the U.S., it is important for homeowners to do what they can to try to improve property values, and the effect of trees on property values is often overlooked. Most articles that focus on the return on investment of home improvements list kitchens and bathrooms. Although improving these areas of your home can yield good returns on investment, these improvements can also be quite costly and, in today’s market, the return may not be as great as it once was. Your next home improvement project may be as simple as planting a tree. What’s the best return on investment for home improvements that increase your home’s value? What are some of the common characteristics of old, wealthy neighborhoods? Think about it. Most of them have big, old trees! Plant a tree in your yard. The value of a tree in your yard will increase as it grows. If you will be in your home for a few years, plant a tree in your yard in the eight to 10 foot range. The cost of a tree this size should be in the $100 to $150 range, depending on species. If you are planting something more sought after, like Japanese maples, expect to pay more, but the value of these trees also increases more as they mature. The Council of Tree and Landscape Appraisers states that a mature tree can often have an appraised value of $1,000 and $10,000. Planting a tree just may yield the best return on investment. And a home improvement project this easy can’t be beat. Dig a hole, twice the diameter of the tree’s root ball, plant your tree, keep it watered until established, and watch as the value of the tree in your yard grows along with the value of your home. The effect of trees on resale value. 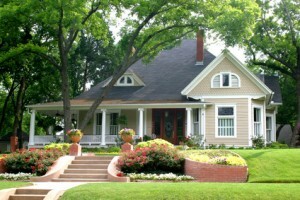 A well-chosen tree adds curb appeal and makes the home appear established within its environment. According to the Arbor Day Foundation’s research, 83 percent of realtors believe that mature trees have a ‘strong or moderate impact’ on the salability of homes listed for under $150,000; on homes over $250,000, this perception increases to 98 percent. The effect of trees on energy efficiency. Depending on how your home is sited on your property, trees can provide shade during the heat of summer or protect your home from the winds in winter. This effect of trees can cut cooling and heating costs. According to the U.S. Forest Service, trees properly placed around buildings can reduce air conditioning needs by 30 percent and can save 20 to 50 percent in energy used for heating.ö If you’re selling your home, this effect of trees on your home could be a real selling point when talking to potential homebuyers. The value of trees for the good of the planet. If you’re not convinced yet of the value of trees in your yard, consider this. Trees do more than provide decoration. As we learned in elementary school, trees absorb carbon dioxide and release oxygen, which helps reduce the impacts of fossil fuel use and keep the planet in balance. The U.S. Department of Agriculture estimates that the net cooling effect of a young, healthy tree is equivalent to ten room-size air conditioners operating 20 hours a day. In addition to this effect, tree roots also reduce soil erosion and storm runoff. These days, educated homebuyers and gardeners are interested in energy efficiency and water quality. If you’ve invested time and energy to plant some trees and improve your landscape, the value of a tree in your yard will earn its weight when it comes to winning over potential homebuyers who care about sustainability.